There are many types of CRM software, which are differentiated by features built specifically for industries or job-types. The most popular CRM’s focus on functionality designed for traditional salespeople but that’s not the only type. Other examples include CRM’s built for specifically for ecommerce websites, project management, operations, mobile salesforces, marketing teams and more. Sales-focused CRM software and related sales management apps, not only allow you to manage your leads, contacts, and pipelines, it also facilitates sales activities like cold calling and emailing. You can also set-up workflows for repetitive sales tasks to increase efficiency. It works by having features that keep important sales tasks front and center for sales professionals using features like activity reminders, task assignments, visual pipelines. Sales-focused CRM software is best for companies with longer and more complex sales cycles with lots of sales activities and larger volumes of customer and prospect data to manage. You can find robust sales-focused CRM at prices ranging from free to $99/month per user for SMB level software. 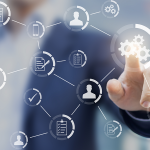 Sales management software features include tools to help sales managers monitor performance and teams become focused on tasks that close deals. This type of CRM software is best for companies managing long and complex sales cycles requiring lots of sales activities. It’s also great for managing larger volumes of customer and prospect data. Pipedrive – Includes a visual snapshot of pipeline stages and the status of activities within each stage using a Kanban board as well as contact insights, customizable dashboards, and sales forecasting reports. Prices range from $12.50/month per user and go up to $49.17/month per user. Freshsales – Features the ability to track deal progress, add sales tasks, and make calls with a built-in phone, all from a Kanban style pipeline dashboard. Prices range from free to $49/user/mo. for SMB level plans. Salesmate CRM – Offers visual sales pipelines, the ability to set sales goals and track progress, and the ability to execute and track sales activities like conducting meetings or demos. It also has a built-in phone with text messaging features. Pricing is simple and affordable at $12/month per user for all features billed annually. Telesales CRM software allows sales professionals and business owners to make, track, and log calls from within the CRM. It works by having a phone built into the CRM platform or by integrating the CRM with a phone system. It allows calls to be placed without leaving the CRM platform, making them a versatile piece of contact management software, and usually offer advanced features like call recording, voicemail setup, call transfers, call routing, and phone number assignment. This type of CRM software is best for salespeople and businesses that depend on calling as their primary tactic for sales outreach, inbound call to action, or both. Prices range from free to $99/user per month for most SMB CRM plans. Telesales CRM software features allow sales professionals and business owners to make, track, and log calls from within the CRM. It’s great for salespeople and businesses that depend on calling as their primary tactic for sales outreach, inbound call to action, or both. For more information on phone systems or VoIP, see our article on VoIP systems for small business. Freshsales – Allows you to place calls from within the CRM, record voicemails and calls, and assign numbers to individuals and teams. You can also create and view call reports which will give you insight into team calling activities. Prices range from free to $49/month per user for SMB level plans. 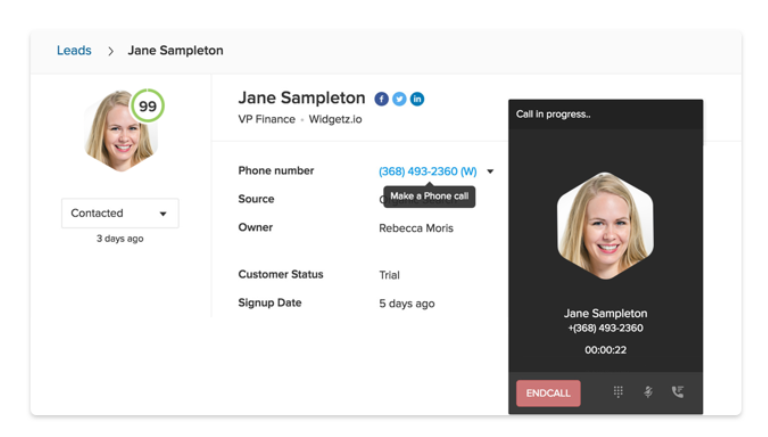 HubSpot CRM – Includes a click to call feature. You can also record calls, log them automatically, and prioritize the calls you need to make based on contact, prospect, opportunity data from within the CRM. The phone feature is available in the free version of HubSpot CRM. Zoho CRM – Features visual sales pipelines, the ability to set sales goals and track progress, and the ability to execute and track sales activities like conducting meetings or demos. It also has a built-in phone and has text messaging features. Pricing is simple and affordable at $12/month per user for all features billed annually. Marketing-focused CRM software provides contact and pipeline organization and are great examples of lead management software. They enable you to perform and track marketing activities including email, social media, and mobile marketing campaigns and works by giving salespeople insight into marketing campaigns their customers and prospects respond to. 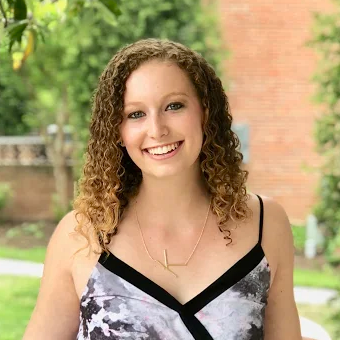 They can also help track offers customers and prospects may be eligible for, allowing sales and marketing to coordinate efforts and work together to close deals. These types of CRM help align the efforts of multiple teams or departments. Marketing-focused CRM software is best for companies with marketing and sales teams responsible for separate customer-facing initiatives that each should be aware of. It’s also great for companies wanting to track the effectiveness of both sales and marketing activities in one place. Pricing ranges from free to $50/user per month for SMB-level software. Marketing CRM software includes functionality that allows you to perform and track marketing activities including email, social media, and mobile marketing campaigns. It is best for companies with marketing and sales teams responsible for separate customer-facing initiatives that each should be aware of. It’s also great for tracking the effectiveness of sales and marketing activities in one place. Agile CRM – Robust solution that offers advanced marketing execution features like a landing page builder, mobile marketing, email marketing, web to lead forms, and social CRM. Prices range from free to $49.99/month per user. Zoho CRM – Feature-rich CRM offering marketing tools like landing page creation, mobile marketing like SMS/text messaging, social CRM, email marketing, and web forms. Prices range from free to $20/user/mo. HubSpot CRM – Free CRM with marketing features like social media ads, email marketing, and list building. Upgraded marketing features can then be added on for $50/mo. Project management CRMs enable you to manage relationships and successfully handle post-sale projects. It works by allowing salespeople to convert won opportunities into projects so that post and pre-sale activities are stored in one centralized location, making them particularly informative examples of customer database software. With these features, you can stay on top of tasks, milestones, and deliverables, which improves communication, helps grow long-term relationships and can promote repeat business. Project management CRM software is best for salespeople and businesses with long sales cycles that include projects as part of the sale. It’s also great for project managers and other project stakeholders who participate in post-sale product and project delivery. Price ranges for project management CRM software from free to $99/user per month. Project management CRM features include tools that help salespeople manage relationships and also track post-sale projects. It’s best for salespeople and businesses with longer sales cycles that include projects as part of the sale. Insightly – Includes the ability to automatically convert an opportunity to a project as well as task tracking, assignment, and notification, and milestone creation and management. Pricing ranges from free to $99/month per user. Apptivo CRM – Offers project management tools like project planning, task management, and project billing. Tools like built-in Gantt charts offer a visual overview of project schedules. It also includes billable timesheets and collaboration tools help teams complete project tasks. Prices range from free to $20/user/mo. for SMB level plans. PipelineDeals CRM – Comes with project management features like project milestone, updates and status tracking. You can link key project dates to customer profiles and associate key tasks and events with milestones. Prices range from $25/month per user to $49/month per user. Customer service and support CRMs give sales and customer service professionals a complete view of the customer. This saves time from having to look for information from sales data that may be archived or in a different system. Customer service and support features include help desk tickets, collaboration tools for team-based support, call center software, and phone integration. This CRM software is best for businesses managing long-term relationships with repeat customers or product sales that require product or project support after the initial sale, like field service management companies or those offering tech support. The price range for SMB mobile CRM software is free to $99/user per month. Customer service CRM software features give sales and customer service professionals a complete view of the customer and saves them time from having to look for information from different systems. This type of CRM software is best for businesses managing long-term relationships with repeat customers or product sales that require product or project support after the initial sale. Agile CRM – Includes helpdesk software, tools to create a Knowledgebase for customer self-service, as well as live chat and service automation tools. Pricing ranges from free to $47.99/month per user. Freshsales – Offers customer service tools including the ability to create teams, handle calls, including call transfers, and integrate chat and helpdesk features with Freshdesk and Freshchat. Prices range from free to $49/month per user. An ecommerce CRM enables product-based businesses to facilitate transactions within the CRM. It works by combining traditional CRM features with the ability to process, ship, and track customer orders. It helps ecommerce businesses manage inventory, supplier relationships, price lists, customer service, and more. Advanced features include customer returns processing and management, workflow automation, and wholesale account management. Ecommerce CRM software is best for companies that sell and ship products and manage inventory. Price ranges for ecommerce CRM software are from just under $10/user per month if you’re using an all-purpose CRM with ecommerce features and integrations like Agile to $799/user per month for a specialty ecommerce solution like TradeGecko. Ecommerce CRM software includes functionality that allows product-based businesses to facilitate transactions within the CRM. It’s best for companies that sell and ship products and manage inventory. Check out our articles on ecommerce resources for small business for information about additional tools designed to aid online businesses. TradeGecko – Provides tools like inventory management, payment processing, B2B ecommerce, backorder management, and shipping in addition to core CRM features. Advanced features include workflow automation, wholesale buyer management and multi-channel sales. Pricing ranges from $79/month per user to $799/month per user. Agile CRM – Features include live chat and service automation, 2-way telephony, web-to-lead forms, landing pages, and syncs with Shopify and Stripe. Prices range from free to $47.99/month per user. ReadyCloud CRM – Supports multiple ecommerce sales channels including Amazon and Shopify. You can also process order shipments and returns and manage orders and tasks in this CRM. Pricing ranges from $24/month per user to over $124/month per user. Collaborative CRM is a software that enables teams to collaborate while working to close an opportunity or working together on a post-sale project. Features include group emails, tagging, group task management and assignment. Other collaborative features include real-time messaging across multiple teams, document sharing, and video calls. These tools keep teams across your organization up to speed with what’s going on with a deal or project. This type of CRM software is best for salespeople who depend on other people within their company to close deals and/or implement projects. The price range for SMB mobile CRM software is free to $179/user per month. Collaborative CRM software features include tools that let teams collaborate while working to close an opportunity or working to complete a post-sale project. It’s best for salespeople depending on other people within their company to close deals and/or implement projects. Zoho CRM – Features include real-time messaging across multiple teams, feeds, group chats and video calls. These features are available on Zoho’s CRM Plus with prices starting at $50mo./user. Freshsales – Includes collaboration features and integrations like territory call transfers and team phone numbers. Another collaborative Freshworks product includes Freshdesk which allows teams to resolve support issues. Prices range from free to $49/user/mo. for SMB level plans. Bitrix24 CRM – Features an enterprise-like social network, workgroups, and video conferencing. Pricing is free to $179/month per user for the cloud version. Reporting and analytics-focused CRM software offers advanced reporting and analytics features that help you create reports to forecast sales or help you identify areas of opportunity within your sales process. It works by taking data from your sales activities and compiling it into visual reports, making it easy to spot trends. Reporting and analytics-focused CRM software is great for sales managers and business owners who use them in their planning process or to take corrective action in areas of concern. SMB prices range from free to $99/user per month. Analytics CRM software features include advanced reporting functionality so that you can create reports to forecast sales or help you identify areas of opportunity within your sales process. It’s great for sales managers and business owners who use data to make decisions about their businesses. 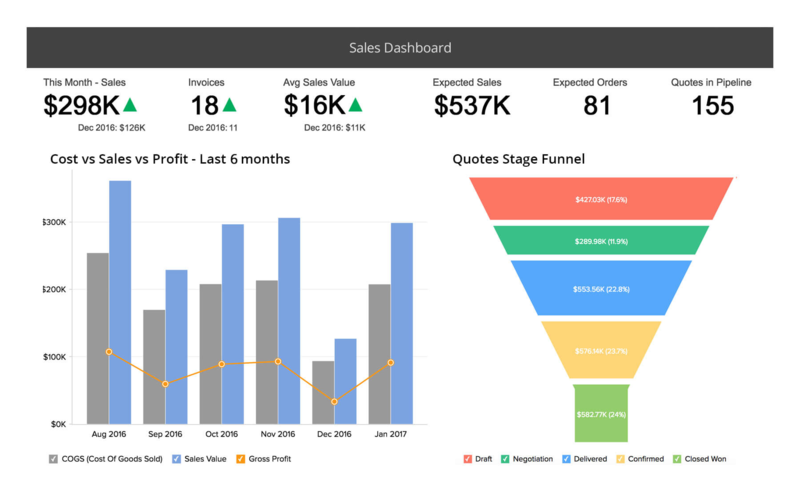 Check out our article featuring sales dashboards and metrics to learn more about analytics for small business. HubSpot CRM – Offers a variety of reports and analytics including lead sourcing reports that tell you where your best leads come from, and revenue summary reports which tell you where your revenue comes from. Pricing ranges from free to $50/month per user. Pipeliner CRM – Comes with sales reporting tools such as the ability to create real-time reports with just one click, over 20 preformatted reports and a KPI dashboard that includes 27 prepopulated KPIs. Pricing ranges from $35/month per user to $85/month per user. Zoho CRM – Includes advanced reporting and analytics features including forecasting, drill-down sales funnel statistics, and the ability to personalize dashboards and share reports. Prices range from free to $20/month per user for SMB plans. Operational CRM software enables business owners and managers to manage and track sales and business functions like HR, accounting, inventory, support, and projects in one system. It works by incorporating features like QuickBooks or Xero integration to include payment features and payment data. It also works by allowing users to generate reports based on data from major business areas that managers can use to make business decisions. This type of software is best for business managers needing a complete view of their business to make decisions. It’s also great for salespeople and other business professionals, like customer service, who need one platform to perform their functions where other functions, like sales, influence their job tasks. The price range for SMB mobile CRM software is free to $179/user per month. Operational CRM software features enable business owners and managers to manage and track sales and business functions like HR and accounting in one system. It’s best for business managers needing a complete view of their business to make decisions as well as salespeople and other business professionals needing one platform to perform their duties. Bitrix24 – Includes modules for business areas like marketing, customer service, social engagement, project management, and HR as well as tools like live chat to support customers, Gantt charts to manage projects, and email campaigns to generate leads. Pricing is free to $179/month per user. Agile CRM – An end-to-end CRM that includes Quickbooks integration where you can manage invoices and payments as well as sales tools to help manage your pipeline, marking tools like landing pages, and functionality to manage helpdesk tasks. Pricing ranges from free to $29.99/month per user. Apptivo CRM – Includes invoicing, project management, work orders, and helpdesk and sales management features. It offers a product catalog and the ability to issue quotes. Pricing ranges from free to $20/month per user. Mobile CRM is software that enables field-based sales teams to access CRM data and perform sales activities on the go. It works by CRM providers creating a mobile app that gives salespeople the same or very similar functionality as their desktop CRM. Mobile salespeople can send emails, make and log calls, access reporting, and even receive assigned leads while in the field. Advanced features include contact geolocation and business card scanners. Mobile CRM software is best for salespeople who spend a lot of time in the field and need the same access to their CRM as they have when they’re in the office. It’s also great for salespeople who maximize time in their territories by locating nearby contacts and prospects for meetings. The price range for SMB mobile CRM software is free to $99/user per month. Mobile CRM features give field-based sales teams a way to access CRM data and perform sales activities on the go. It’s best for salespeople who spend a lot of time in the field and need the same access to their CRM as they have when they’re in the office. Pipedrive CRM – Its mobile app includes map features that show nearby prospects and customers and provides directions from your location as well as mobile contact and lead management. Pricing ranges from $12.50 to $49.17/month per user. 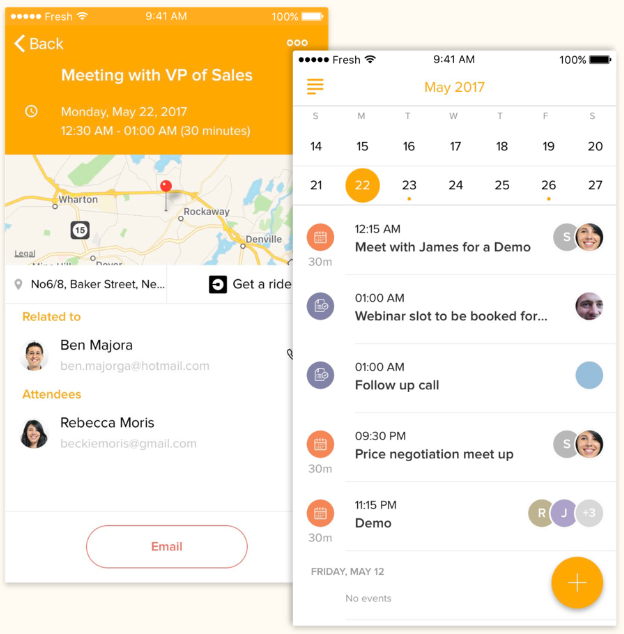 Freshsales – Its mobile app includes sales management tools such as making calls, sending emails, managing pipelines, and scheduling meetings on the go. You can even book an Uber directly within the app. Prices range from free to $49/mo/user. Zendesk Sell – This mobile app offers the same CRM features on your phone or tablet as found in the desktop version as well as email templates. Pricing ranges from $45/month per user to $95/month per user. Industry-specific CRM software is created to help salespeople and business managers navigate sales and relationship management within specific industries. It works by having features that are unique to an industry that may not necessarily be in others and are often built by professionals with real-world industry experience. However, not everyone has the resources or technical experience needed to create a truly custom CRM. Fortunately, there are some industry-specific, off-the-shelf solutions with prices that can range from free to just under $200/user per month. 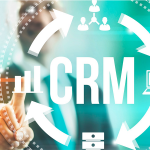 Industry-specific CRM software features include functionality created specifically to help salespeople and business managers navigate sales and relationship management within niche industries. These features can include integrations with third-party quoting tools, such as in the case of insurance CRM, or have industry-specific automations like VIN look-ups, as in the case of automotive CRM. Wise Agent – Real Estate specific CRM allowing realtors to track leads, manage their sales cycles, and execute marketing activities. It works by taking the complexities of real estate transactions from prospecting to managing transactions. It’s affordable with prices starting at from $29/mo.for 4 users. Job Nimbus – Construction specific CRM for those in the construction industry. It works by incorporating the nuances of construction sales and project management into the features of a construction-focused CRM from building job estimates and invoices to managing jobs. Pricing for this Job Nimbus is simple, at $25/month per user. CaterZen – Restaurant industry CRM for those in the restaurant or catering industry. It works by combining lead and prospect management with catering order processing and catering delivery management where you can assign drivers in one platform. Prices range from $129/mo. to $199/mo. The vast number of diverse businesses has driven the demand for and creation of different types of CRM software. Small business owners will benefit from assessing what they really need and want from a CRM and choosing the best type of CRM to meet their needs. Whether it’s activity or industry-specific, there is a CRM on this list that will help you meet your sales and customer relationship goals. Which CRM Is Best For You?